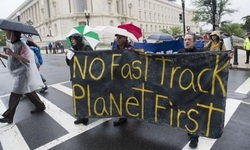 The TPP agreement is being negotiated — in secret, even from Congress — between representatives of governments and giant, multinational corporations. (Government negotiators are not prevented from seeking lucrative corporate jobs if negotiations are completed in favor of those corporations.) Groups representing the interests of labor, environmental, consumer, human rights or other stakeholders in democracy are not at the negotiating table. And, not surprisingly, it appears that the agreement will promote the interests of giant, multinational corporations over the interests of labor, environmental, consumer, human rights or other stakeholders in democracy.